Former middleweight world champion Gennady Golovkin will fight undefeated Canadian Steve Rolls in June as he returns to the ring following his defeat to Saul "Canelo" Alvarez last year, organizers said Tuesday. China's boxing world champion Xu Can is confident in defending his title against Shun Kubo of Japan for the WBA featherweight crown. Chinese Kazak boxers are ready for their bouts against Japanese fighters in a Sino-Japanese boxing competition to be held in Shanghai on March 30. Anthony Dirrell captured the vacant World Boxing Council super middleweight world title with a 10-round technical split decision over Turkey's Avni Yildirim Saturday in Minneapolis, Minnesota. Newly crowned WBA featherweight world champion Xu Can of China said that he is confident for his rematch with Jesus Rojas. Chinese boxer Xu Can registered a stunning upset of Jesus Rojas with a 12-round unanimous decision victory in a featherweight title fight on Saturday. 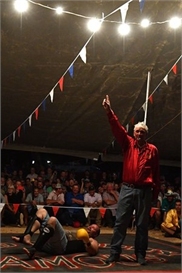 When Fred Brophy bangs a drum on the floodlit stage outside his boxing tent, the large crowd gathered in front of him falls silent in rapt attention. Deontay Wilder retained his WBC heavyweight title after a thrilling split decision draw with Britain's Tyson Fury at Staples Center in Los ­Angeles on Saturday, leaving both fighters talking up a rematch. Thousands of child boxers compete in Thailand's traditional martial art with dreams of belts, glory and prize money - but the death of a 13-year-old has lit up a sensitive debate over whether competitors start too young. Boxing superstar Floyd Mayweather Jr said Monday he will come out of retirement to fight a Japanese kickboxer half his age, Tenshin Nasukawa, on New Year's Eve in Saitama. World heavyweight champion Manuel Charr has had to call off next week's title defense, and is set to be stripped of his WBA belt, after testing positive for steroids. Gennady Golovkin suffered the first loss of his professional career when Saul "Canelo" Alvares won an epic middleweight world title fight in Las Vegas on Saturday. Manny Pacquiao rolled back the years as he stopped WBA welterweight champion Lucas Matthysse on Sunday - the 39-year-old Filipino icon's first knockout win since 2009. Filipino legend Manny Pacquiao challenges Lucas "The Machine" Matthysse for the World Boxing Association (WBA) welterweight belt on Sunday knowing defeat could lower the curtain on one of the greatest careers in boxing history. Philippine boxing legend Manny Pacquiao says the outcome of his July bout against Argentine Lucas Matthysse will likely determine whether he will hang up his gloves after a storied career.